From Saturday the 28th till Monday the 30th of April, All For Blue visited Amorgos, one of the most beautiful Greek Islands along with the Club of Motor-powered Boats of Syros, for underwater and beach cleanups, ocean conservation seminars at the schools, while at the same time throughout Greece, everyone was doing the same due to an event that takes place once per year (This time was on Sunday 29.04) organized by Let’s Do It Greece. On Saturday, All For Blue’s actions began from teaching the kids at the Agiali’s school everything concerning the protection of our oceans and seas and how important is to take care. The duration of the presentation was about one hour long, while afterwards we took action, doing underwater and beach cleanups with great success. 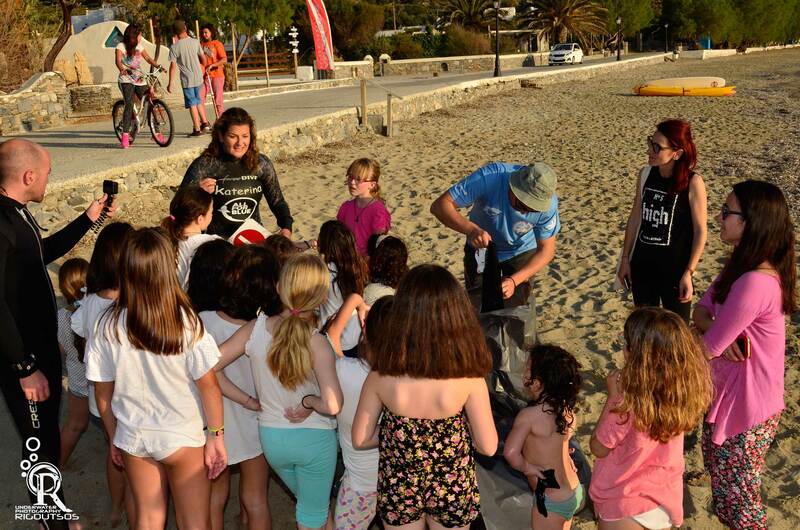 On Sunday All For Blue sailed away to a steep beach in Amorgos called Paradisia, where with the help of the Motor-Boat Club of Syros we collected more than 350kg of rubbish including a fair amount of shoes, clothes, pans and plastics. On the third and last day of our journey we started early in the morning with a great ocean awareness seminar to the kids at Katapola school, where more than 70 children learned about the importance of not throwing trash around, how to respect the seas but also the procedures of the cleanups. At the beach, All for Blue’s volunteers collected car wheels, street signs and even a huge pipe that took about 60 minutes to bring them to the surface of the sea and eventually out of the water.